One of the signature features of the Galaxy S7 and S7 edge, Always On Display, just received a rather useful update. 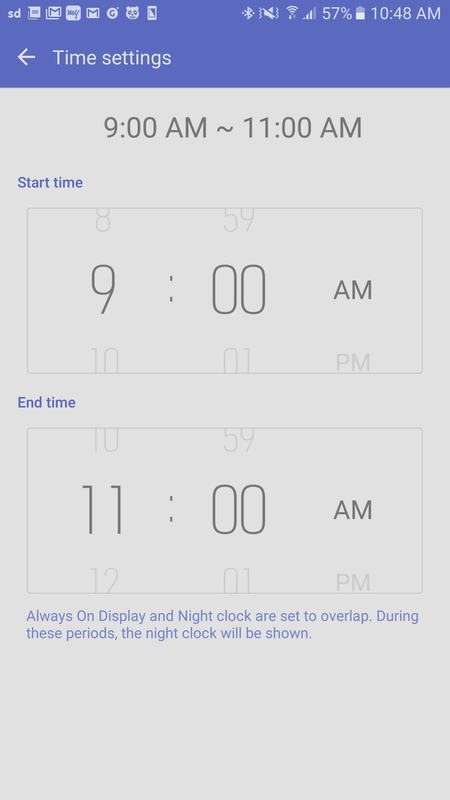 Users can now predefine the time window in which Always On Display of their top-shelf Galaxy phones will remain on, which is quite a useful addition. After all, you have no use of this feature during the night when you are fast asleep, do you? This will save you squeeze out your battery even further, though if we have to be honest, Always On Display does not consume that much power, usually less than 1% per hour. Apart from improving Always On Display, Samsung also updated the Night Clock on the Galaxy S7 edge. It seems you can now have it enabled for up to 18 hours while you could keep it on for a maximum of 12 hours previously. The update should be hitting your Galaxy S7/S7 edge units shortly, but in case it doesn't, you can manually check if it's available for your device. You can do so by navigating to Settings, then Display, then getting inside Always On Display, and finally tapping the "Update" button in the About section. Nice update but still I find AOD pretty useless since it drains battery quite a bit than I thought. I thought it would be significantly efficient then LG G5's lcd display which it isn't. The whole idea of AOD was to conserve the battery as people turn on the phone several time during a day to just look at the time but if it drains so much then I don't it fulfills the purpose. "nonetheless I don't use it all the time, only in situations where I want to be watchful for notifications otherwise I turn it off entirely" Very good "common sense" usage of your device. Seems everyone would come to the same conclusion and use things when they need them, not just on all day. That's the benefit of customization. You customize to fit a need, not just turn it on an leave it on even when you don't need it. It doesn't seem so bad, yes it trains but having a timer on it pretty much solves that, that way it isn't 'always' always on, but only on when you want it. Seems like a good compromise? Yep. Gotta agree on that. But still a compromise. Another good news related to s7 is Samsung Electronics Europe today announced an exclusive Gear VR content package for new Galaxy S7 customers. http://goo.gl/4lNKTK Industry analyst house CCS Insight forecasts that revenues for VR headsets globally will reach $10bn by 2020, with Western Europe accounting for $3bn. Yes... because they want you to upgrade from the S6 to the S7. This feature is a fail because it does not show notifications from other apps and when the always on display is on the notification light doesn't work! I figured that out pretty quick and since the always on display doesn't show other notifications I'm still having to turn the screen on all the time, FAIL. So I turned always on display off and now the notification light is working perfectly. Until they fix that issue with AOD being on and the notification light not working, I won't be using it. Now make it work with other app notifications please.